A Lesson we taught each believer is found in 2 Corinthians 5:20, “We are ambassadors for Christ, God making his appeal through us. We implore you on behalf of Christ, be reconciled to God”. We emphasized that very Christian is an Ambassador and every home is an Embassy for the Kingdom of God. On our second day in this home, the 80 year old Christian widow invited 22 of her neighbors and friends to hear the message of God’s love in Jesus Christ. We were able to love on these dear people and share with them the life changing reality offered in Jesus Christ. I was so encouraged in how simple faith in Christ was for the Tanzanians to grasp and live out in their neighborhood. They crowded in this place of worship to hear the gospel and have their needs prayed for in Jesus name! Day 1, I came upon the young lady with the white headband and the Babu and Bebe on the ground. I shared the Gospel with them and the grandparents came to Christ. The young lady did not, but she was heavy with fear and sadness. Seems she cannot have children, and in this culture, that is not good for a young married woman. She cried as I laid hands on her and as I prayed for God to heal her and grant her a child. Her mother is the lady with the red hat, and was not there Day 1, but was out working in the fields. After she came home, she came looking for us in the village, because she wanted Jesus….but we had already left! Day 2, we went back with Chrissy in tow because I wanted her to pray over the young lady. The mom was there and her eyes lit up big time when she saw us. I shared the Gospel and she came to Christ right then and there. I told the young lady that even though she could not have children..yet… that she was beautiful in the eyes of God, that she is worthy and valuable and that He loves her. I’m not the type of person to throw myself into an unfamiliar situation especially with people I don’t know. But I did it. This Jersey girl joined a bunch of Texans in Africa to share the good news of Jesus Christ with the unreached people of Tanzania. This was a life changing moment that I’ll never forget. As we went through the week, I realized that if I want to follow Jesus and love people well, I must do so at the expense of my own comfort. I embraced the awkward, out of place, not-knowing-what-to say moments by stepping out of my own discomfort and into love. I saw people instead of their differences, and saw God more than I ever have before. I feel so alive and I’m thankful that I was able to see this part of the world and love and encourage the people that live there. I’m more grateful for what God has blessed me with – friends, family, health, to name a few. Thank you for this opportunity and I’m looking forward to serving with you all again! “For above all, love each other deeply, because love covers a multitude of sins.” 1 Peter 4:8. On our last night in the village, we had a crusade. We set up a stage, blasted music, and danced around. We walked through the market to invite the locals to join us in the celebration. I found myself surrounded by a swarm of beautiful children, fighting to hold my hands. I gave them each one finger, 10 kids on 10 fingers, and I have never felt so much love. It reminded me of Jesus and how much He loves and cares for us. He marvels at us, even though we are broken sinful people. He loves us deeply, more than I can understand, and His greatest act of love (dying on the cross and rising again) covers all our sins. I got to experience a glimpse of the joy and love that awaits for us in Heaven, all through the smiles of little children in Tanzania. I realized how big our God is, how He speaks Swahili, and He loves His children. He loves His children in Tanzania as much as He loves His children in America. God knows no boundaries. We got to share the truth about Jesus Christ to a group of people who had never heard His story. It was indescribable how much light it brought to their eyes. I could see the hope and the desperation for a Savior. Our mission was to share the Gospel of Jesus Christ with His children who had never heard, so that they might know and repent and believe. We got to share with them the joy of loving Jesus, through our dancing and singing and teaching. Yesu ni mwema. Jesus is good. When reflecting on the last 2 weeks in Africa, there are so many things to love, remember, and cherish forever. Sharing the gospel with people who had never heard the name of Jesus. Discipling natives and new believers, showing them how to study the Bible. Sharing testimonies with albino women and realizing our similarities outweigh our differences. The list goes on and on. But if I had to pick 1 moment to be my favorite, one that will keep me going until I can return, it would have to be the way we worshipped together. Dancing our hearts away, singing and shouting in all different languages, all to worship the one true God. It was absolutely beautiful. Man, isn’t heaven going to be fun? The Tanzanian culture is very welcoming and we experienced this every day. But on one particular day my translators and I came across a group of brick makers. Because work was slow and they were just hanging around, they immediately invited us in. After a couple of games of checkers, all of these guys got to hear the Gospel and decided to accept Christ! Not only did we have a great time (even though I lost every game) but with God we were able to bring the life changing reality of Jesus Christ to these good men! At the beginning of the trip, I thought I would have a hard time and would want to leave. Little did I know, I was beyond wrong. We arrive to the compound we were staying and as soon as we walked out many people greeted us with hugs and broken Hellos. We spent the Saturday we arrived and the Sunday after learning Swahili, going to church and visiting markets. Monday through Friday were the days that changed so many people’s lives. During the week, we went to the villages that had never heard the name of Jesus. We had to get Government permission to even be there to tell people about the Son of God. Dan Nance and I were partners and went to these huts together to tell people about the savior. We met with many people during this time but there was one family that impacted me in ways I didn’t know were possible. This woman was very shut off towards us and did not talk to us at all. Dan knew something was wrong so he asked if there was anything we could pray for her about and came to find she cannot have children. Living in a Muslim culture while being a woman who cannot have children is a very big deal. That is one of the soul purposes of women in this culture. We prayed with her and she was still shut off. We continued to visit families, make relationships, and play with the village children but this woman would not open up to us. I became down and sad but knew God was doing amazing things. By the second to last day we were in the villages I took my translator and sat with her while she was cooking. I have never seen anyone laugh so hard in my life. She had finally opened up to us and we had many conversations about small unimportant things and huge life things. I realized in this moment that I needed to be her friend. Someone to be there for her. She needed someone to have fun with. I was so focused on bringing people to Jesus that I stopped thinking about building relationships with these amazing people who deserve a friend more than someone telling them something they have never heard before. God taught me that he is the same in America, Africa, and all over the world. God taught me that his people are his people. God taught me that I love his people and want to teach globally. God taught me a lot this trip but he showed me how faithful he is to his people and how important it is to tell people about his son Jesus. This was my first mission trip. I was very excited and nervous. When we finally went out in the villages I was concerned that when I shared the gospel no one would understand the message I was trying to convey. Then, I remembered that when Christ is lifted up He will draw all men also Chris always reassured me that I was doing fine and encouraged me to do more on my own. As a result, I became more confident and comfortable in my ability to minister. 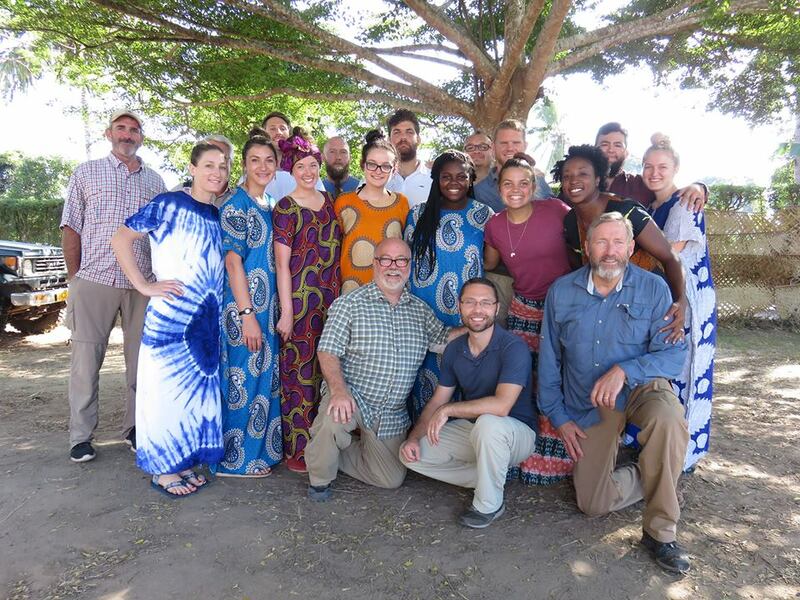 I was able to connect, minister, and bring multiple Maasai Women to Christ and one of them was baptized! I saw firsthand that the harvest is plentiful but the laborers are few. It was a rewarding experience! On our second full day that we were in Mlandizi, all of the women went with Didi to a village to see what it was like to be a woman in that village. While we were there, a few little kids peaked their head around the corner to look at us where we were sitting. They kept giggling and talking about us so I got up and peaked my head around the corner and they all freaked out because they didn’t expect it. The kids threw me a ball and we ended up throwing the ball around and dancing together. It was so amazing to love on those kids even though they had no idea who I was. When it was time for us to leave, they kept asking if we were coming back tomorrow. Unfortunately, we were not so we said goodbye to each other and they gave us hugs and waved as we were driving away. God’s love was definitely being reflected onto those kids through us. For four days, I shared the Gospel in the simplest way I could. The most absurd thing happened. People responded. Witnessing more individuals accept Christ as Lord and Savior in a week span than in all my life previous stole my breathe away. Yet never have I felt more fulfilled. We were able to take part in the Great Commission from Christ to “… make disciples of all nations, baptizing them in[b] the name of the Father and of the Son and of the Holy Spirit” (Matthew 28:19). However, the village leaders were afraid losing power over people. They instructed the villagers not speak to speak with us. Men and women who had proclaimed Christ the day before hid from view when we returned to their homes. On the final day, we went to gather those who wished to be baptized. All but one refused. Despite being alone, one woman of the Maasai wished to publicly declare her faith because of the one who was alone for her.